✔ *UK delivery for just £30! For over a hundred years, our postal services commissioned top-quality, British-made bikes for posties delivering our mail. But the way we use postal services has changed: we’re sending more parcels thanks to internet shopping and fewer letters due to email. Bikes are no longer suitable for our posties and they have gradually been phasing out their use. But that’s not the end of the story. For the past few years Krizevac Project (a UK-registered charity) has been on a mission to save the bikes from landfill as they are decommissioned. We’ve given them a new lease of life: supporting the successful growth of social enterprises in Malawi, Africa – one of the poorest countries in the world. This is a unique and time-limited opportunity for you to be part of this exciting project. There will only ever be 5000 Elephant Bikes, making these individually numbered, fully refurbished postal bikes real collectors’ pieces. Ideal for town or leisure cycling, they’re built to last using British components and top craftsmanship. 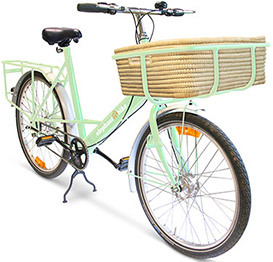 Plus with Sturney Archer three-speed gearing, drum brakes and great load-carrying ability, your Elephant Bike will give you years of happy cycling. We’re helping to develop skills in the UK by working in partnership with HM Prisons across the Midlands. Offenders are developing their employment skills by helping us to refurbish the bikes. They strip the frames prior to professional shot-blasting and powder coating in a range of attractive colours. Offenders are given the chance to attain a certificate in bicycle maintenance, boosting their skills, confidence and likelihood of gaining employment (a key step to preventing repeat offences). Therefore buying an Elephant Bike means you’re helping to transform lives here in the UK as well as in Africa. You buy a bike, we give a bike, it’s as simple as that. 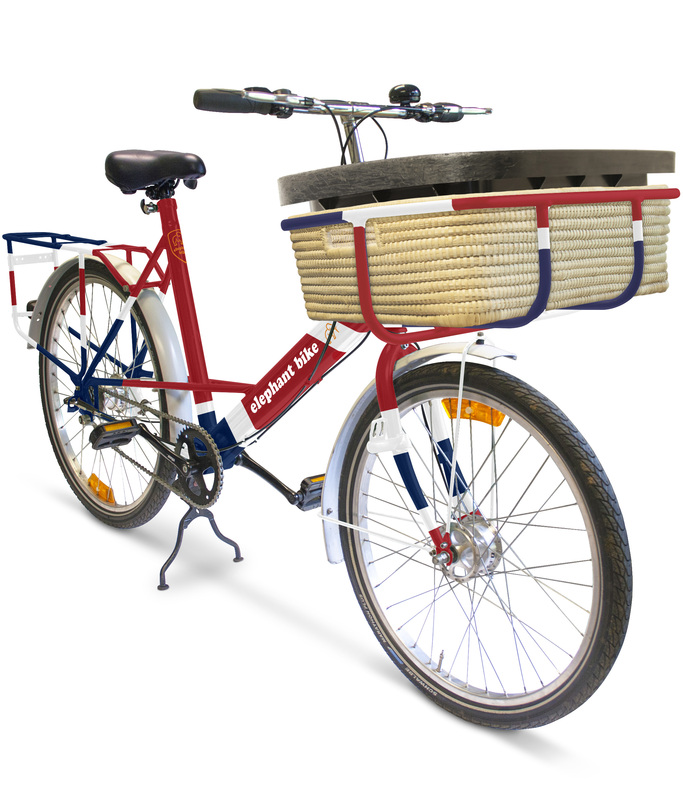 When you buy your robust and sturdy town bike, we will donate a bike to our social enterprise in Africa, where owning a bike can mean securing work, generating an income, or getting an invaluable education. In Chilomoni Township, Malawi a quiet revolution of enterprise creation is helping to end poverty for some of the world’s most vulnerable people. Since 2007 Krizevac Project has worked hard to create viable social enterprises. These businesses create training opportunities and meaningful jobs. To date 380 people who previously lived on less than £1 per day are in secure long-term employment. All of the money generated by the enterprises pays for children’s education and community family support. This helps to break the cycle of poverty and creates future Malawian business leaders. One of our most successful enterprises is BeeBikes. Sponsorship from Mobal Communications Ltd, a US mobile phone company, helped Krizevac to ship thousands of ex-postal bikes to Malawi over the past six years. The African workshop employs eight local people to repair and service the donated bikes from Britain. They are then sold to Malawians who can travel to work, transport goods to market and travel miles to school or college. Bikes in Malawi can be life transforming and often mean an income for life. The profits from Beebikes funds care for pre-school children in our own Mother Teresa Children’s Centre in the heart of the township. Some of the Malawi bikes were sold to Liwonde National Park; home to the majority of Malawi’s protected wildlife. The Fence Wardens were delighted with their ex-postal bikes and their new found ability to complete 30-mile patrols of the rhino fencing in record time. But it turns out that elephants don’t like red and the Wardens were at danger of being chased. Desperate to solve this problem, the Wardens tried out some re-sprayed green bikes. Remarkably, the elephants no longer gave chase… and the first Elephant Bikes were born. It costs us around £200 to collect, store, process, shot-blast, powder coat, transport, purchase spares and baskets, final quality check, sell, and package and post each bike. 100% of the remaining £80 is used to ship bicycles to Malawi. This represents at least 1 bike (and actually nearly 2 bikes) sent to Malawi for every bike sold here in the UK. Krizevac Project is a UK Registered Charity Number 1115608. UK delivery for just £30. 1. What size frame do I need? Choosing the right frame size for you depends on your height, inside leg measurement and your reach. You are welcome to phone us for advice, but as a rough guide: The smaller frame is recommended for riders with a 27-35 inch inseam (inside-leg), and the larger frame for riders with a 31-40 inch inseam. Riders sized 31-35 inches can adjust either frame to fit. How big is an Elephant Bike? 2. How many gears do the bikes have? 3. Can I try a bike before I buy one? You are more than welcome to come to Staffordshire to try a bike any time during standard office hours. If you don’t live close by, please contact us on 01543 888494 to check which shows or exhibitions we are doing in your area. 4. What is the total carrying capacity of the bike? 5. Can I have custom colours and logo? Yes! Please call us on 01543 888494 to talk about your needs so that we can give you a quote for additional costs. 6. Can I fit a child seat? Yes, many standard rear or up-front seats fit. 7. How much does the bike weigh? 8. Do you fit new parts? We re-use all serviceable and working parts wherever possible, we like to recycle! There are some exceptions; every bike has a brand new bottom bracket for example. But all parts are checked, tested and then tested again before we dispatch your bike. 9. I have a mechanical problem with my bike, can you help? We provide a six month guarantee (normal domestic use only) for all mechanical parts of your bike, so if you have a problem within six months of purchase, please contact us so we can help you. We will either send you a spare to fit yourself if it’s easy. Or we’ll ask you to take your bike to your local independent bikes shop (and we’ll even find the address and phone number for you!) and we’ll pay the bill. In extreme and rare circumstances, we will replace your bike completely at no cost to you at all. Please see our full terms and conditions on the buy a bike page, or on your order confirmation email. 10. I’ve change my mind and I don’t want my bike now that I’ve tried it? No problem, these things happen. Just let us know within 14 days of purchase. We’ll ask you to put it back in the box so that we can arrange to have it collected on a day that suits you. We will ask you to pay for the return collection costs. Please see our full terms and conditions on the buy a bike page, or on your order confirmation email. 1. Can I collect the bike from you? Yes, you are more than welcome to collect your bike any time Monday to Friday in office hours. Please contact us before you place your order so that we don’t charge you for delivery. 2. Do you deliver internationally? No, we only deliver our Elephant Bikes to UK addresses. 3. Do I have to be at home when my bike is delivered? Yes, all deliveries need a signature. Our standard delivery needs you to be available to receive your bike between 8am-6pm, but we will always phone you before we dispatch so that you know exactly which day your bike will arrive. If you have to “nip out for ten minutes” and you have a safe place your bike can be left please leave a note for our couriers. The note should have the date, details of where the bike can be left and your name and signature, the driver will need to take the note away with him as proof that you accept full responsibility for the safety and security of your bike while it is left unattended… much easier just to stay at home and wait for your bike! 4. Can I have a timed delivery? Yes, this is possible to most UK addresses, but there will be a surcharge and this will depend on your needs. Please contact us on 01543 888494 during office hours so that we check your requirements and let you know about costs. 5. Can I have my delivery on a Saturday? Yes, there is a £15 surcharge for this. You will need to specify a Saturday delivery when you go through our check-out and the surcharge will be automatically applied. 6. I live in a narrow lane/ restricted access property, can you still deliver? Please call us on 01543 888494 before you place your order so that we can double check your delivery options. 7. I live on the 56th floor of a block of flats with no lift, can you still deliver? Your bicycle weighs about 23kg, we would seriously recommend that you re-consider and purchase a bike that weighs a lot less if you have a lot of stairs to negotiate on a regular basis. 8. Is my bike flat packed? No! Your bike is all built ready for you. We do turn the handle bars and remove the pedals, but we provide you with the tools to attach these, you can be riding 15 minutes after you receive you boxed Elephant! 1. Is the bike sent to Malawi exactly the same as my Elephant Bike? 2. Do you only send Elephant Bikes to Malawi? No, we send all sorts of donated bikes to Malawi. We send as many postal bikes as we can, at least as many as the number of Elephant Bikes we sell, because they are so strong and good for African roads. But we also send mountain bikes, cargo bikes, road bikes, even children’s bikes. We typically send 3 times as many bikes to Malawi as we sell in the UK each year. 3. What happens to the bikes when they arrive in Malawi? They are renovated and sold, relatively low cost, to anyone who needs a bike. The money raised from the bike sales in Malawi funds vital childcare and family support for orphaned and vulnerable local children. 4. Why is it important to get bikes to Malawi? Owning a bike in Malawi is life transforming! It means you can cycle to school or work which can save time and money. It means you can transport goods to market or set up your own business. Studies in comparable areas show that household income levels can rise by about 35% if a family owns a bike. 5. How do I know this is all happening… do you really send a bike to Malawi? 6. Can I contact the person in Malawi who receives my “give one” bike? No, this is not possible. The bikes in Malawi are sold as a normal commercial transaction (albeit not-for-profit to fund the children’s centre) and we’re proud the Malawi bike workshops operate as a business rather than a charity project. We don’t keep track of the customers or share their details. Where possible we do ask people to share their stories and we share these with you via video and social media updates. 7. Can I donate a bike to you? Yes please! If you can deliver it to us, we welcome donations. 8. Do you only take bikes or are there other things you collect for Malawi?